This article was submitted by reader and ’67 enthusiast Ron Waller. Thank you very much for your contributions to 1967beetle.com. 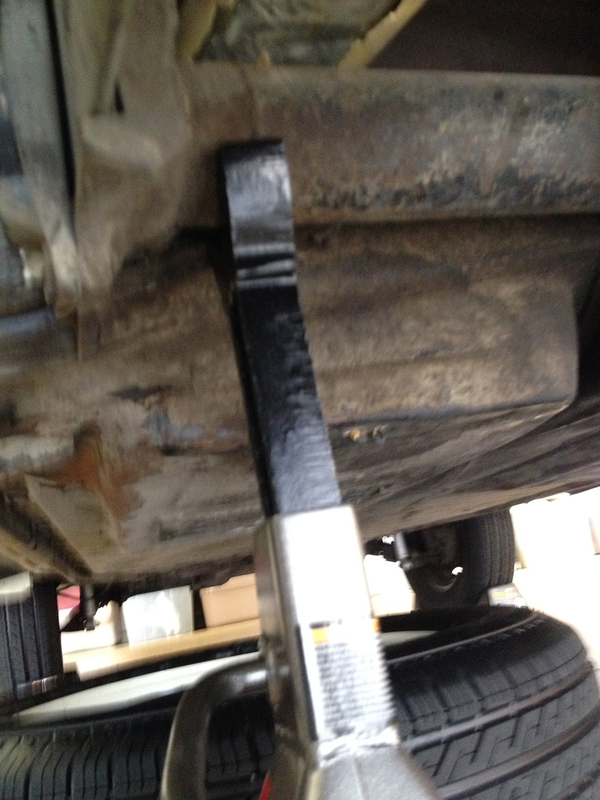 I looked all over, and found many articles about where to place jack stands after you’ve lifted the car. But I could not find anything about raising the rear of the car with a floor jack. I wanted to adjust the clutch and drain the transmission oil while I was under there. Following this article are couple of thoughts that definitely will help with those tasks too. I have included some photos. Make sure the surface on which you’re working is level and firm. Chock the front wheels securely. You may have to readjust them after the car is on the jack stands. I leave the car in gear and have the parking brake on. I do that as an extra safety step and then release them when the car is secured. Loosen all the lugs while the car is still on the ground. 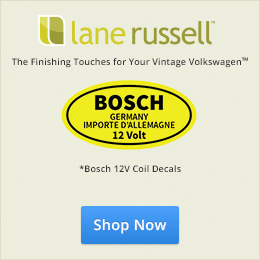 For those of us who have or have had VWs in the past – that’s a given! But easy to forget. Use a good quality hydraulic or floor jack. I was very lucky that my neighbor had these. The front end is rather straightforward. There actually is a “box-like” structure on the center of the front axle where the jack fits perfectly. The rear (which was my issue) requires a little more “target practice,” but once you get there it’s easy. You need to look front of the transmission, where the “Y” of the frame meets. There is a small drain hole there, which is your target. I think I have a pretty good picture of it. Several articles suggested putting a board (2X6) on the jack and actually having the board touch the frame. Sounds like a good idea, but I had trouble keeping the board in place on my jack. The jack I was using (see picture) fit perfectly on this “drain hole.” Place the saddle of the jack right there and lift away. On my car, the left side lifted about three inches before the right side began to move. 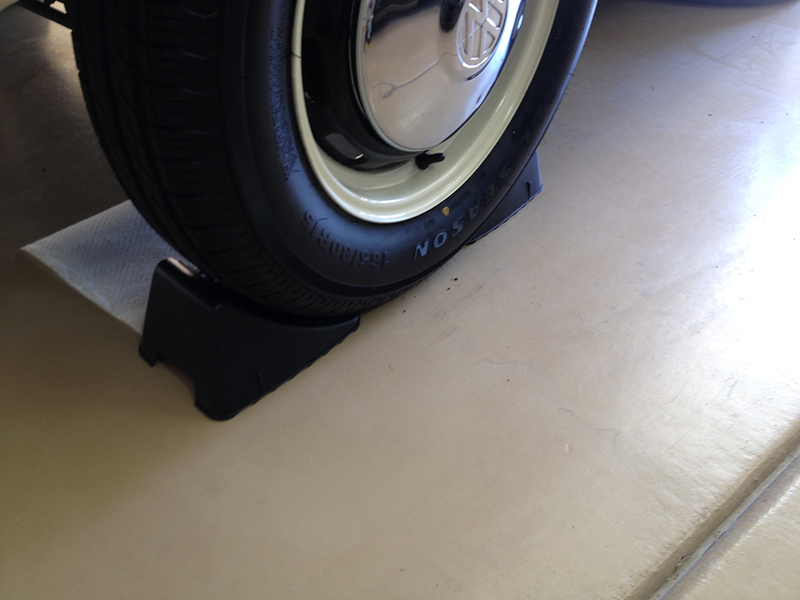 Once the tires are off the ground, place the jack stands as close as you can to the out-board sides. Readjust the front wheel chocks. The wheels move as you lift the car. I read somewhere to put the wheels and tires under the car as added protection, just in case the car were to fall. Waste of time. If the car falls the wheels are not going to save you. But it is a good place to store them while working. There actually is a seam or rib around the rear axle and I put the stand just to the inside of that. When your tasks are done, put the wheels back on the car. Again, for old timers, I am stating the obvious. Line up the wheel and place one lug in the top hole. I put the toe of my shoe under the tire to help line things up. I secure all the lugs as tight as possible, but don’t torque them until the wheels are on the ground. When you are ready to lower the car, reverse the procedure. Lift the car and remove the jack stands. Mine were easy. Just release the locking pin and they slide right down. Yank them out of the way and lower the jack. I’m stating the obvious, but be careful and methodical. Since my goal was to adjust the clutch, I learned a lot about what NOT to do. So I will give you some advice. Read all the stuff about clutch pedal free-play. And, the 1967 has a wing nut, so buy the clutch adjusting tool. It is not expensive and many retailers carry it. Forget trying to do it by hand. The bottom two drain holes on the transmission are easy to get to. Might require some muscle power, but there is plenty of access room. I read somewhere that this is a messy job and they were right. Have plenty of rags around. The filler hole is a whole different story. That bugger is hard to get to AND put power on it. After several tries which all failed, do this: use a 17mm hex tool. Put a 17mm box end wrench on the short end and then line it up on the hole. You may have to tap the box wrench “several” times to get it to move, but eventually you’ll get it loose. My garage has a slight decline (most do) so the car actually was level after I put the rear jack stands in place. Once you have filled the transmission, put the car on the ground. 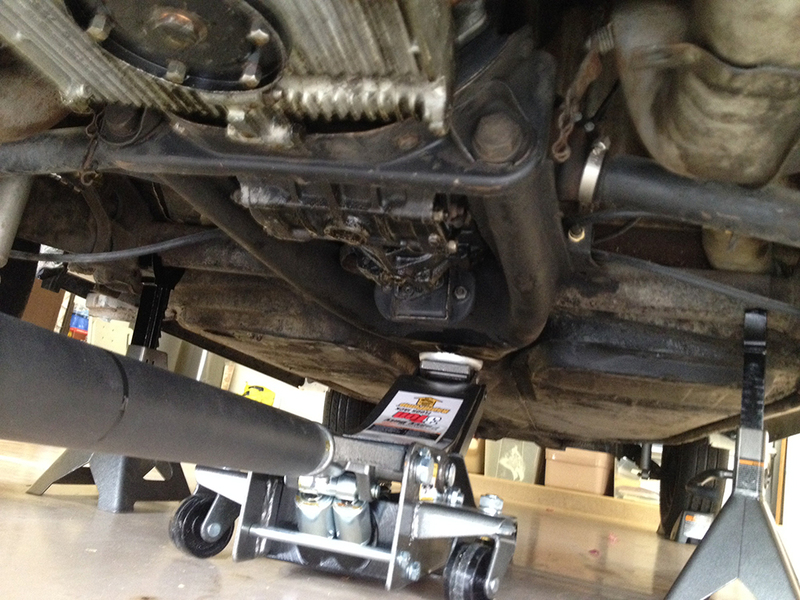 Then drive the car around (to allow the transmission oil to enter the tubes) and then lift it again (don’t forget to install the jack stands!) and top off the oil. Again, there are plenty of articles on both of these subjects, but hopefully my hints will make the jobs much easier. Great article, as always. 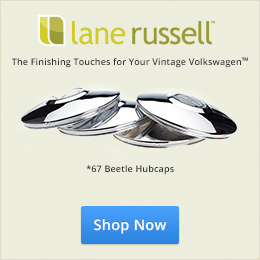 Thanks for your contributions to 1967beetle.com. Just to add to this, when you are adjusting the clutch, spray some good penetrating oil on the threads of the cable. I often do that at first, then back the nut off some to get to the threads under the adjustment nut. I then use anti-seize lube on the entire threads of the cable. This prevents it from being difficult to adjust the clutch the next time it requires it and you can do this by hand and not need the clutch adjustment tool. I’ll also inspect the rubber Bowden tub and cable to insure both are in good condition. I’ve seen clutch cables fraying while adjusting the clutch and will change the cable right then to prevent it breaking while driving down the road. The last suggestion I have for anyone with a “new” to them beetle is to pull the pedal assembly loose from the pan and inspect the clutch hook. When I bought my 67 bug a few years back, I did and found the clutch hook was almost worn all the way through from the clutch cable attaching point! Installing a new one is straight forward, and the replacement part is inexpensive. Don’t forget to put a bit of grease on the hook. While the pedal assembly is off, take a moment to look at the accelerator cable as well. Bill – good stuff. I will do that the “next” time! Jay, an elegant article, showing once again that there is a right way to do things — even what one would think are simple things. Thank-you for your clear writing style and not leaving out details that some may think are obvious. Guys like me need those “obvious” details. I appreciate the clear pictures, too! Hello, Tom…I only edited the article–Ron Waller did the study, testing and actual work. He took photos and wrote an account of his labors. So…KUDOS go to Ron Waller! And, leave it to Eric Shoemaker for streamlining things. When he completes the final stages of an article, a polished piece emerges. I was glad to see this article because I’ve seen cars that have been raised using the cross-member beneath the transmission bell-housing. Eventually, the lifting will bow the cross-member–which thing is not good! Just bought a 1974 VW Super Beetle…getting ready to convert to electric drive. Never jacked up a car (or worked on one for that matter). Your article will be my reference guide….thank you for the excellent instructions. Thanks, Ryan! We are here to help. Thanks for this, the photos are incredibly useful. I need to bleed the brakes on my ’66 Beetle, but first I need to eradicate a large family of black widows living underneath and inside the wheels (they were inherited from the previous owner). Suffice to say I am not thrilled about reaching under the car. At the very least you’ve removed my guesswork so I can confidently get the jack in place. Yay! D.J. I was extremely worried the first time I raised the rear of my ’67. But everything worked out just fine and I am still here to tell about it! First, check the front wheels. I used a 2×6 on top of my jack (I did not in the attached photos). That helps to spread out any strain on the frame. It’s a little tricky getting that board to stay in place, but once you start to lift it goes well. I was nervous the first time I put jack stands under the rear (do not use the old factory jacking points! 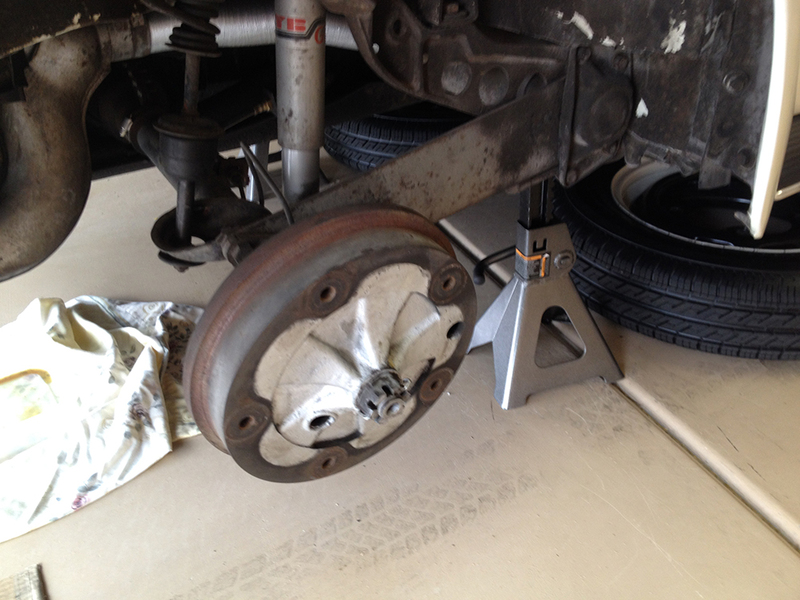 ), I placed some 8×8 blocks I had under the rear tires. It just takes a little patience. Do one side at a time. I also placed the space under the car. As far as the black widows I can’t help! We have to worry about rattle snakes and scorpions here. If I can be of any other help, just let me know.